2018, ISBN 978-1-77216-128-1, paperback 312 pages. Based on the life of Canadian politician Grace Woodsworth MacInnis, Grace in Love is the story of a young woman’s search for love, commitment, and fulfilling work. This book is both historical fiction and a novel of ideas. It’s also the story of a budding politician and a political party. Along the road to love and commitment, Grace Woodsworth discovered her vocation: a political life in the party founded by her father, J.S. Woodsworth: the Co-operative Commonwealth Federation (CCF), now known as the New Democratic Party (NDP). The book opens with Grace’s arrival in Paris, France, on a scholarship to study French at the Sorbonne. 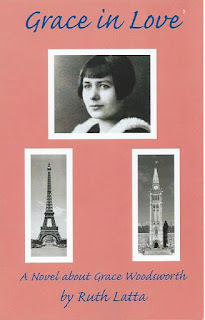 In a series of flashbacks to Grace Woodsworth’s life growing up in Winnipeg, Vancouver, and Ottawa during the roaring twenties and the great depression of the 1930s, Ruth Latta illustrates Grace’s development into a confident, diplomatic, and modern young woman who understands people, communities, and politics. Having co-authored, with Joy Trott, the biography Grace MacInnis: A Woman to Remember, Ruth Latta is an expert on her subject. In Grace in Love, she holds a magnifying glass to a crucial portion of Grace Woodsworth MacInnis’s long life. Because Grace in Love is a novel, not a biography, some fictional characters mingle with the real ones. The first half of Grace in Love is set in France, where the reader follows Grace’s travels and adventures, including sexual harassment on a train journey from Brussels to Paris. During her student days in Paris, Grace became fluent in French by immersing herself in the language and culture of France. She went to historical locations with friends and with two of her siblings who visited her in Paris at different times, Charles at Christmas and Belva during the summer. Together, they toured cathedrals (Notre Dame and Chartres), the Eiffel Tower, Versailles, Luxembourg Gardens, and famous Parisian neighbourhoods, such as Montmartre and Auteil. At the Sorbonne, Grace made friends with both Parisians and other foreign students. After classes, Grace and her friends met in cafés to discuss socialism, religion, and love. During one of these gab sessions, Grace met Willem Van Aarden (not his real name), a South African graduate looking for an academic position. As Grace and Willem dated, going to the theatre, the opera, vaudeville performances, museums, and movies, she fell in love. Willem’s desire for an open relationship forced Grace to define her values and her goals regarding love and family. “You’re moving too fast for me,” she told him one night at the movies. When Grace returned to Canada after graduating from the Sorbonne the following year, she left Willem behind and began teaching high-school French in Winnipeg. She was dismayed to discover that her students were indifferent to learning French. A subsequent stint teaching primary school convinced Grace that teaching wasn’t her vocation. She fell into a depression and was diagnosed with “battle fatigue.” Her family’s support and acceptance brought Grace through this dark period. Grace’s mother suggested that she write about her problems and the resulting “Apologia” expressed Grace’s fear and despair over her lost vocation. Grace soon realized that working on her father’s election campaign was much more her cup of tea. J.S. Woodsworth’s 1930 campaign for re-election to the federal seat representing Winnipeg North Centre was successful, and Grace moved to Ottawa as her father’s parliamentary assistant. Her duties included helping rookie members of the Ginger Group write punchy speeches for the House of Commons. One of those MPs was Angus MacInnis. What began as a job quickly evolved into a romance with a much older man, and Grace and Angus reserved every evening for long walks together along the Rideau Canal. Grace in Lovecomes full circle with the couple travelling to Europe after their marriage, where they spend time with Grace’s Parisian friends. In Grace in Love, the heroine’s character is realistically drawn through vivid examples of her activities and ideas. Her dedication to studying French, her love and respect for her family, her determination to communicate clearly with her fiancé, regardless of the subject, combine to form a picture in the reader’s eye of a strong, capable, smart, loving, and hard-working young woman. Events come alive in Grace in Love because of Ruth Latta’s excellent research and the story’s high level of realism. The Estevan miners’ strike, the suppression of Communism, birth control, non-traditional families, and equal pay for women are some of the socio-political issues impacting the lives of these characters. Grace in Love: A Novel about Grace Woodsworth is a fascinating read about an important Canadian. It’s ideal for readers who enjoy history and politics. Grace in Love is available from Baico Publishing (www.baico.ca). About the reviewer: Peggy Lynn Kelly is a retired English Professor completing a scholarly work with Carole Gerson on Canadian women writers in print and broadcasting, 1914-1960.